The deck was covered with fish. I’d never seen anything like it. There were long, slender eels, black sharks, pale rays, silvery grenadiers with long, pointy tails, and great black things with huge, dark eyes. We’d needed the biggest winch on our research vessel to haul them up from the bottom of the North Atlantic, some 5,000 feet below the surface and a hundred miles east of New York City. My colleagues and I waded into the catch and began sorting the various species into piles, marveling at their extraordinary forms. I was a young fish biologist at the time, part of a team studying the distribution of fishes elsewhere in the deep sea: not at the bottom but in the midwaters, a part of the water column above the seafloor. We regularly trawled the midwaters at various depths down to 3,500 feet. After towing a net for as long as three hours, we’d come up with a sample at times no bigger than a teacupful—or, if we were lucky, a small bucketful—of sardine-size creatures. But a break in that routine had given me a chance to see what lives even deeper, and so we broke out the bottom-trawl net. Even as the ship’s crane swung the bag, or “cod end” of the net, aboard, I could see that bottom samples were entirely different. The net was bulging, and when the knot cinching it shut was undone, a great swirl of mud and sea creatures had spilled onto the deck. And the fishes! Not a cup or a bucket of small fry, but more like half a ton of strange and wonderfully big fishes. I was hooked. That first bottom trawl, forty years ago, launched a lifelong career in research and teaching about the fishes that live at the bottom of the ocean. My colleagues and I have learned that those bottom-dwelling animals typically grow slowly, delay reproduction, and live long lives—adaptations to making a go of it in the cold, dark, nutrient-poor waters of the deep-sea floor. 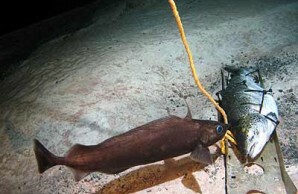 But those same attributes make the fishes particularly vulnerable to a new stress: deep-sea fishing. As populations of shallow-water fishes have crashed, the global demand for seafood has led to rapid overfishing of the bottom, along with the habitat destruction that bottom-trawling wreaks. 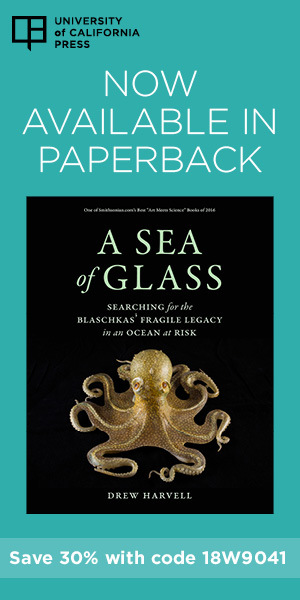 We estimate that more than 20 percent of the northwest Atlantic’s deep-sea fish species have declined so seriously that they should be considered for threatened or endangered status. And the same thing is happening the world over: deep-sea fishes everywhere—from Greenland halibut near the Arctic Circle to Chilean sea bass off Antarctica—are being hunted to the verge of extinction. If I were to return to that spot in the North Atlantic where I made my first bottom trawl, the deck would no longer be covered with fishes. I’d be lucky to catch a bucketful. The deep sea does not begin at the beach; it encompasses the waters from surface to seafloor that lie beyond the continental shelf. Shallow coastal waters overlie the shelf, which can extend a hundred miles or so from shore. There, at the true edge of the continent, where the water is about 600 feet deep, the topography steepens. The seafloor plunges some 6,000 feet down the continental slope, then declines more gently down the continental rise and onto the abyssal plain. The average depth of the plain is 13,000 feet, but it is interrupted by trenches as deep as 30,000 feet, or by mountainous ridges and volcanic seamounts, some of which reach the surface to form island chains, such as Hawai’i [see illustration left]. 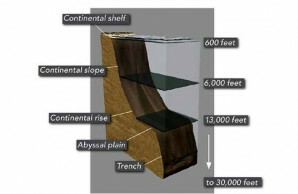 Cross-section shows the depth profile of the seafloor; the vertical dimension is exaggerated for clarity. The deep-sea midwaters are home to an unusual cast of characters: lanternfishes with glowing lights, silver hatchetfishes with telescopic eyes, and viperfishes with tremendous fangs, among many others. 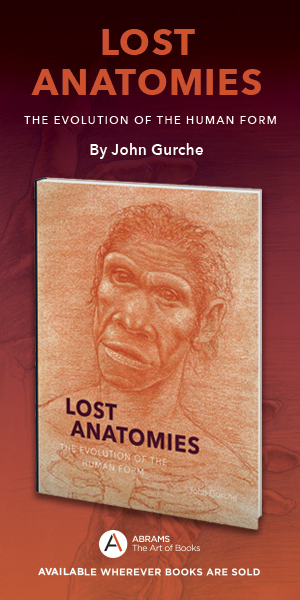 But midwater fishes are sea monsters in appearance only: most are no longer than a foot. Because of their diminutive size and relatively low density, no extensive deep-sea midwater fishery has yet developed. The continental slopes are another story. At depths between 600 and 6,000 feet, the slopes are where the fishing happens. Animals living there are bigger and more abundant than in the midwaters of equal depth, largely because the bottom provides both structure and a collection place for food particles falling from the productive surface waters. Yet despite the increasingly heavy commercial fishing there, much remains unknown about continental slopes. Worldwide, just a fraction of 1 percent of their total area has been explored, and investigators have only recently begun to appreciate the complexity of slope habitats. In part, that’s because most of the slopes appear to be featureless expanses of dull mud. Only a few areas, such as the hot vents of tectonically active ridges and trenches, were acknowledged as dynamic and structured ecosystems. But it turns out that even the mud is home to thriving populations of crustaceans, sea stars, urchins, worms, and myriad other creatures. Recently, even deep-sea coral beds have been discovered to be widespread on the world’s continental slopes. They play host to a highly diverse and little-known fauna, and it is likely that their tangled structure provides protective cover to juvenile fishes. The fishes of the continental slope display numerous adaptations to deepwater living, which include cold tolerance; longevity; and enhanced vision, hearing, and sound production for making their way in darkness. Certain species, such as deepwater rays, rockfishes, and eelpouts, bear live young or build nests to give their young a head start in a tough environment. Many slope dwellers are relatively large—between one and three feet long—which enables them to forage over broad areas. Many also live in schools. Both their size and schooling behavior have made certain species attractive targets of fisheries—which has in turn brought about the fishes’ undoing.